Here are the results of a study in which we modeled two farms that differed in size, grazing management, and feeding strategy. We first modeled the optimal management and performance conditions for each farm with the assumption that forage on pasture was measured accurately and budgeted optimally. We also established an economically optimum balance of pasture utilization and harvest of excess forage. All simulations with pasture measurement errors resulted in lower farm profits (i.e., net returns) compared with a farm managed optimally. Under or over estimating the amount of forage available on pasture by 10% to 20% caused a loss of \$6 to \$48 per cow per year. Underestimating forage production on pasture resulted in less hay and grass silage being produced, more pasture consumed, and less forage sold, compared with the base farm. In other words, if the amount of forage is underestimated, the paddocks are oversized and there is less grass area available for harvest with more trampled and wasted by animals. On the other hand, feed costs decreased when pasture forage yields were underestimated, but this was entirely offset by the reduced amount of forage sold. When the amount of forage on pasture was overestimated, the paddocks were too small and the animals actually had less pasture forage available than anticipated. This meant that supplemental feed costs increased, although that increase was partly offset by an increase in the amount of forage sold. There is an old saying, “the eye of the master fattens the flock.” Our experience has shown that it takes more than just an eye, it takes sound measurements of the value of each input. Of course actual results will vary from farm to farm, but the information presented in this article shows that it pays a dairy farmer to use an accurate method of estimating forage yield and then also to spend the extra time needed to budget forage on pasture. Regular pasture monitoring can provide other benefits, such as identifying pastures that need improvement. Keeping a close eye on pasture conditions will likely lead to additional improvements that were not accounted for in our analysis. Inaccurate forage budgeting on pastures increased feed costs. Mistakes in sizing paddocks could not be compensated for later in the grazing rotation. Farmers have a few options for measuring pasture yield. 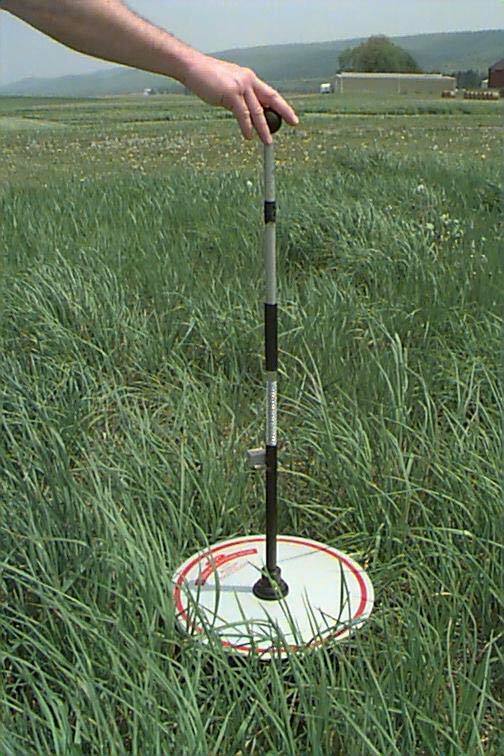 These include pasture rulers, plate meters, and electronic gauges. Pasture rulers simply measure canopy height and assume that forage yield is directly related to height. Pasture rulers are cheap, but they can be very inaccurate. Plate meters improve accuracy by measuring compressed height. Rising plate meters range in price from \$200 to \$400. Electronic gauges measure the electrical capacitance of the sward. Their cost ranges from \$400 to \$1300, and dew, rain, and other factors can cause erratic readings. New technology based on the light reflectance properties of vegetation may enable accurate estimates of the yield and forage quality of standing forage in real time. Current research in the USA and New Zealand seeks to adapt this technology for pasture management in the future. How can a producer improve accuracy of measurement? First, the measuring tool (pasture ruler, plate meter, electronic probe, or the producer’s eye) must be calibrated properly and locally. Commercial calibrations for plate meters and gauges are frequently developed with pasture species in other parts of the world. Research shows that both tools require frequent and site-specific calibration. Calibration requires comparing measurements to hand clipped samples, so the producer should contact their local grazing advisor for assistance. Second, the tool must be used correctly and consistently. For example, using a “walking stick” motion with a rising plate meter will generate errors. Using the electronic probe in very wet vegetation will also cause inaccuracy. Lastly, the producer must collect enough readings to represent the paddock or pasture. Typically 30 to 50 readings should be taken in a 1- to 2-acre paddock. More readings should be taken in larger pastures.